Miller and cjhsa posted this within a minute of each other. Love it. Can set your watches by the predictability. Barack Obama's campaign lashed out Sunday at the editors of The New Yorker magazine for a cartoon cover that depicts the Democratic candidate and his wife as fist-bumping terrorists. The magazine's editor described the cartoon, called "The Politics of Fear," as satire. The Obama campaign called it "tasteless and offensive." "The New Yorker may think, as one of their staff explained to us, that their cover is a satirical lampoon of the caricature Sen. Obama's right-wing critics have tried to create. But most readers will see it as tasteless and offensive. And we agree," Obama campaign spokesman Bill Burton said. "Our cover ... combines a number of fantastical images about the Obamas and shows them for the obvious distortions they are," he said in a statement. "The burning flag, the nationalist-radical and Islamic outfits, the fist-bump, the portrait on the wall - all of them echo one attack or another. Satire is part of what we do, and it is meant to bring things out into the open, to hold up a mirror to the absurd. And that's the spirit of this cover," Remnick said. Obama brushed off the brouhaha. "I have no response to that," he told reporters when asked about the cover, but his supporters are infuriated. The McCain campaign joined in piling on The New Yorker. "We completely agree with the Obama campaign that it's tasteless and offensive," said campaign spokesman Tucker Bounds. I'm waiting for Jesse Jackson to comment. Like you, sozobe, I am not too worried about these kinds of stunts nor about the typical people who peddle it. In fact if the election season so far has told us anything; anytime this kind of thing gets going, Obama somehow comes out of it ahead. So; keep it up, miller. 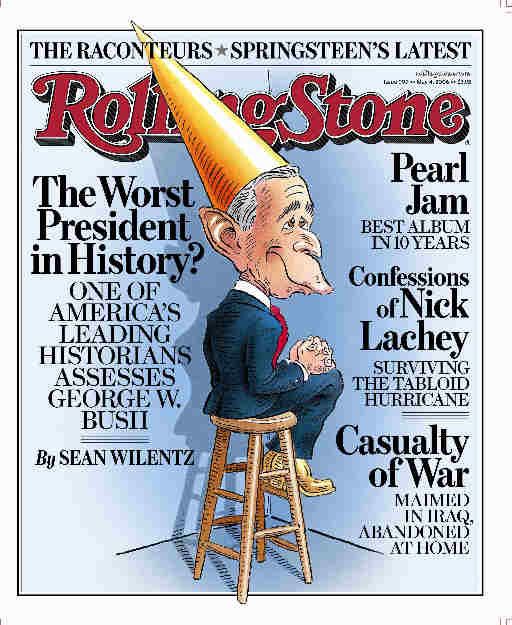 boy, this race issue is a sensitive one-- i am a fan of Barry Blitt but i find this cover to be tasteless and not funny. it fails on so many levels. Great satire designed to expose nuts like Miller for what they are. This will work in Obama's favor except with the Swift Boater vote. That was rough by any standards. I do think the excoriation of Miller for merely presenting the cover of the Times went a bit far, though. The cover, titled Watch Your Back Mountain won the 2006 American Society of Magazine Editors award for Best News Magazine Cover. The ASME, in announcing the award, said that the image "evokes both the smugness of a vice president implicated in catastrophe and the cluelessness of a president incapable of stopping him". I never knew Obama played in The Black Crowes. I guess it's "smart politics" for the Obama campaign to whine and protest anything and everything that makes the candidate look in anyway bad, but it is irritating. i don't think it's great satire, at all. it's offensive. Mildew may be a nut-job, but i'm not getting at how this exposes him/her as such. white people have completely underestimated the depth of the damage done to black people-- this new yorker cover, although meant to be satire, cuts at something below the surface, unspoken. the B. Blitt cover is completely different. If Obama was depicted in any of the ads Bush was, it wouldn't blip on my radar. It almost seems as if the McCain campaign PAID for that. I'm sure they didn't, but this is the kind of thing that can torpedo Obama's campaign....and it is highly racial. I'd like to know how the New Yorker is spinning this. Where are the unspoken racial stereotypes in this cover? That all blacks are muslims? That all blacks are unpatriotic? That all blacks support Osam bin Laden? That black women are all gun toting militants? This cover is satire that is not even directed at Obama. The New Yorker is trying to get all the nutty accusations against Obama to stick? I was wrong. I can't justify referring to it as "highly racial."